The St. Vincent de Paul Society of Crook County has signed a three-year lease with Lutheran Community Services Northwest and will open a food pantry on Tuesday, April 16 in the former hospital building. "We've really changed our business model," said Charlie Kurtz, who became St. Vincent de Paul Society of Crook County president Feb. 1. "We're going to be strictly donation and minimum cost, and we've cut our costs way down." The organization closed its doors at its former Northeast Court Street site at the end of September in order to reorganize and downsize operations. Now, a team of about 30 volunteers will oversee the food pantry and social services programs. The food pantry will be open from 1 to 3:30 p.m. each Tuesday, Wednesday and Thursday. 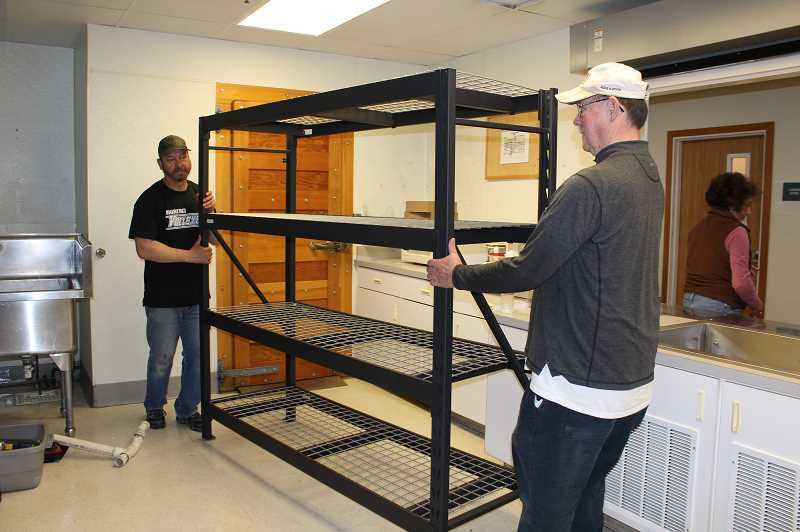 Last week, a crew of St. Vincent de Paul volunteers converted the kitchen into a food storage area. They assembled shelves in the dining room, which will be the open shopping area. The board secretary, pantry manager and Kurtz will use three of the offices, while the other two will be interview rooms. Kurtz said the new location is much smaller — and more manageable — than the organization's previous footprint. For many years, St. Vincent de Paul operated a food pantry, social services programs, thrift store and clothing recycling operation on Northeast Court Street. The thrift store and recycling operation generated income to help keep the doors open. "The business model fit the site we were on," Kurtz pointed out. "We were on a site with three buildings, over 8,000 square feet of building space on a site that's more than an acre that cost us $2,500 a month." However, a lack of volunteers and increased operating costs resulted in the board deciding to close the thrift store on Nov. 1, 2017. The recycling operation collected excess clothing donations from Central Oregon, bundled them and sold them to a recycler in Seattle who in turn sent them to Third World countries. It continued to operate at a profit for a while. However, Kurtz said the reimbursement rate dropped from 14 or 15 cents a pound down to 4 cents a pound. Former president Jim Rodosevich knew it was not going to continue to work and that it was time to close the doors before they went bankrupt. So, last fall, the recycling operation, food pantry and social services programs ceased in Crook County in order to reorganize. Rodosevich wanted to reopen in a smaller location with fewer expenses. He looked into a handful of options and finally found a space at the former Pioneer Memorial Hospital building near the former lab at Lutheran Community Services Northwest. "They'd been advertising space for lease for some time on their marquee out here on the street," Kurtz said, adding that a NeighborImpact employee told Rodosevich that it might be a good place for the food pantry. The two organizations signed the three-year lease on March 29. The lease accounts for $1,700 of the $4,500 monthly operating expenses. The former operation had a $100,000 annual budget, which included as many as 10 part-time employees. Kurtz said the organization is now completed funded by donations from grants, corporations, churches and private individuals. NeighborImpact, the regional food bank, provides St. Vincent de Paul with three streams of food, including free USDA food, Oregon Food Bank food that costs 15 cents a pound, and food from local grocery stores. The local food pantry crew will pick up food from NeighborImpact in Redmond each Monday morning and from Grocery Outlet, Ray's Food Place and Trader Joes during the week. The 1017 Cattle Project donates steers that are ground into 200 pounds of meat that costs the program 70 cents per pound for the cut and wrap fee. St. Vincent de Paul will open the pantry next week with 10,000 pounds of food. "We figured two food shipments should get us well stocked and ready to go," Kurtz said. They encourage their guests to visit the pantry once a month, but they never refuse food to anyone. In addition to supplying food to those in need, St. Vincent de Paul also offers social services. People who are in need of shelter, emergency funding for rent or utilities, or even gasoline for their car can visit St. Vincent de Paul. "We can vet them in terms of their needs, and then we can get them in contact with the various churches around town," Kurtz said, adding that eight churches have joined the network and have offered to assist those who need funds. There are three other food pantries in Prineville. Eastside Church is a NeighborImpact Brown Bag site, giving away food at 3 p.m. the second Monday of each month. Last fall after the St. Vincent food pantry closed, the First Baptist Church Food Pantry offered extended hours to serve St. Vincent guests. "We were glad to be able to fill it in," said Don Sawchuk, who oversees the FBC Food Pantry. "St. Vincent's was carrying half the load in the community, and so when we took it all on, we went from 80 to 100 families up to 225 per month." In early March, they went back to fewer hours and are now open to distribute food from 12:30 to 2:30 p.m. the last two Mondays of each month. LCSNW Communication Specialist Michelle Duff said their pantry also saw an increase in use after St. Vincent's pantry closed. The LCSNW Food Pantry is open to the community from 9 a.m. to 4 p.m. Monday through Friday. "We are always glad to help emergent needs, but we are so glad that St. Vincent de Paul will be back up and running," Duff said. "The community need is great, and there was a large hole in the community while they were away."